The ALERT Pro is just like the Delight Pro, AVE and CES, but with all the special ALERT sessions designed exclusively for Mind Alive by Michael Joyce. Both studies showed that ADD behaviours were reduced significantly and reading improved with AVE. Michael used the DAVID's unique patented field stimulation ability to generate a different frequency in each hemisphere of the brain. With this technique and a Symptom Survey checklist developed by Michael, he was able to create DAVID sessions that could stimulate or calm the left, right or both hemispheres depending on the symptoms checked off by the child's parents. People with ADD or ADHD often struggle with other issues such as depression, anxiety, insomnia, cognitive challenges and drug abuse. There are roughly 102 CES studies addressing these issues. There are also CES studies showing boosts in IQ and attention. Over the years, some of our customers have been requesting that we upload the ALERT-ADHD sessions into the Pal36 with CES and the Delight Pro products, as they found that adding CES boosted the effect of the AVE on their clients. Children with ADD/ADHD and behavioural disorders (BD) often struggle with compounded issues such as insomnia, depression, anxiety, poor cognition (mental performance) and a tendency to experiment with drugs. There are several studies using CES to help with these concerns, as shown in Table 1. Parents and clinicians using the ALERT are experiencing very positive results and those that have used AVE with CES say that effects are enhanced when using both together. 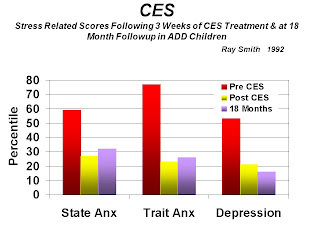 A study by Ray Smith (1992), of 23 ADD children using CES for 45 minutes per day for three weeks showed profound effects in reducing state anxiety (anxiety in the moment) and trait anxiety (overall anxiety) and depression (Figure 1). A follow-up after 18 months showed that the effects were still holding quite well. Ray also measured IQ and found significant improvements (Figure 2), which also held over 18 months. Figure 1. 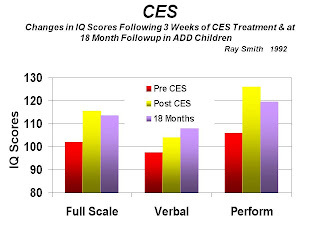 Improvements in Stress Measures Following Treatment with CES in IQ Following Treatment with CES. A 1999 controlled study (n=21) by Susan Southworth, on attention and concentration of normal students found that one session of CES for just 20 minutes improved attention by 31%, whereas the placebo group improved by only 4%. 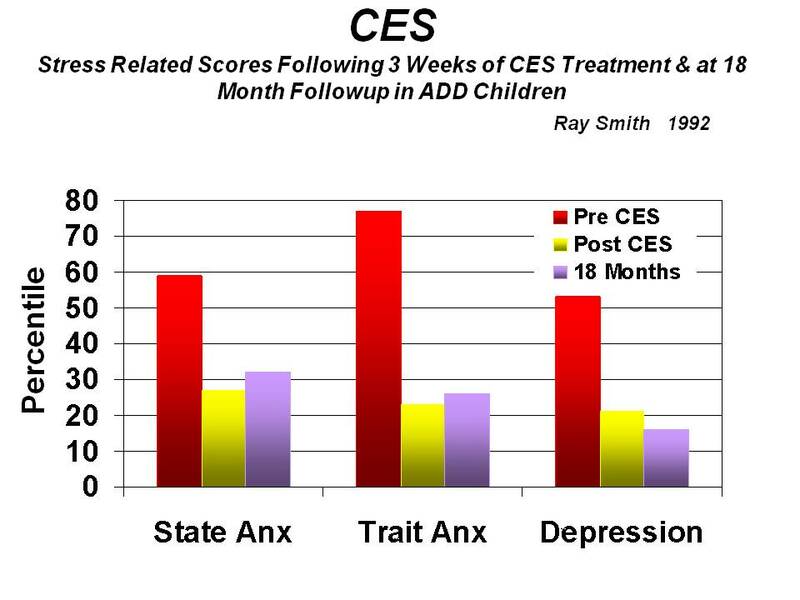 Conclusion There certainly is ample research demonstrating the effectiveness of CES for treating both mood and performance, which may be used as an adjunct to AVE stimulation.